About Naomi: Named Best Folk Singer by Seattle Weekly in 2013, Naomi became the toast of the town and struck a friendship with the much-loved indie songwriter Damien Jurado, who produced her debut album. 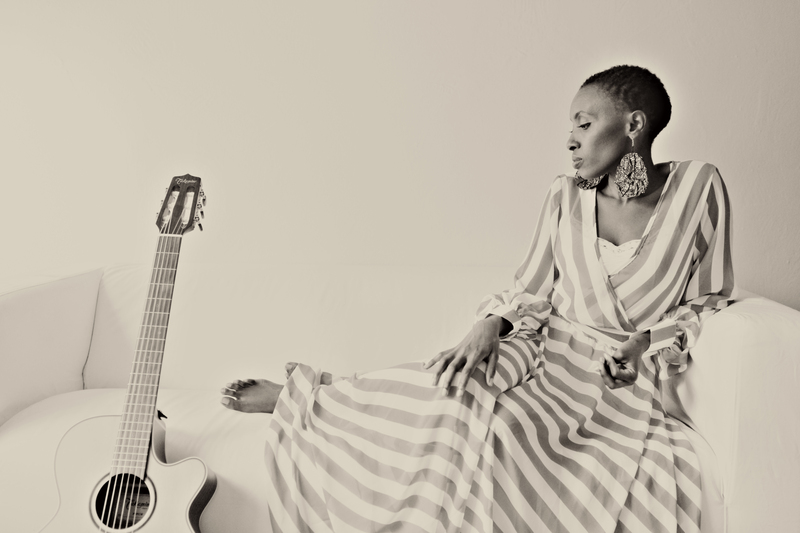 Influenced by two powerful, groundbreaking female songwriters: Miriam Makeba and Tracy Chapman, she’s making music that is imbued with a sense of hope. Our Scattered Words: Some producers completely re-construct songs in their process, others gently nudge things along. What was Damien Jurado’s role and approach on your album? Naomi Wachira: Damien was more like a gentle guide. When we first started talking about producing my album, he was very clear that he didn’t want to change me or make me sound more like him. He just wanted to concentrate on what people liked about my live performances, so we recorded all my vocals and guitar live, which were mostly 1 or 2 takes. Perhaps one of the most crucial statements he made in the begin was, “you cannot cut and paste soul” and that became the bed of our process. It wasn’t about a perfect album, but an album that perfectly communicated my story in a way that most people who’ve heard me live have become accustomed to. It was by far the easiest recording session I’ve been to so far. Our Scattered Words: What are some of the best venues, including house shows, you’ve played at? Naomi Wachira: Some of my favorite are The Neptune in Seattle opening for Damien Jurado. My album release show at Columbia City Theater (where I actually recorded my album). I always enjoy playing House shows because they are so intimate and I get to just tell stories and share more of myself and make it more of a conversation than a performance. Our Scattered Words: You grew up singing Gospel songs with your family. How has that influenced your songwriting and performing now? Naomi Wachira: I think the biggest influence is learning to harmonize. In church harmonies were such a big part of singing and I completely absorbed that and now it’s become second nature to me. I’d also like to think that it has influenced my optimism in life and always wanting to write music that offers hope. Our Scattered Words: What is it about Seattle that made you choose that community as your home? Naomi Wachira: I actually moved to Seattle for Graduate school. I thought I’d stay for 3yrs and then move back to Chicago, but life had other plans. I attended one open mic in the summer of 2011 and that changed my course. I had found an avenue to tell my story, so I kept on telling it and people seemed to appreciate it, so I decided to stay and pursue music. Naomi Wachira: Probably from “African Girl”… I am an African Girl/ I know where I’m coming from / I know who I want to be. Naomi Wachira: I wish I could be a better guitar player or that I could instantly hear arrangements for the all the songs I write. Naomi Wachira: Be true to yourself and your story. Take your time to develop who and what you want to be. Don’t ever let anyone tell what you need to be… you have to make that decision on your own. Naomi Wachira: I love the fact that people now can launch their careers without relying on record labels. The thing I’d really hope for is for majority of musicians to actually make a good income from what they are doing. I hope that there’ll be more leverage for artists with online distributors of music. Naomi Wachira: This is a tough one. I think I’d love to be in a Sister Rosetta Tharpe album session. Naomi Wachira: I’d love to sit down with Tracy Chapman and just understand what lies behind the songs she writes. All interviews, including Naomi Wachira, will be archived alphabetically HERE for easy access in the future.